Ringworm is a fungus that causes itchy, scaly ring-shaped skin infections. Common in cats, ringworm is highly contagious and easily spread among animals and humans. Ringworm infections are most likely to occur on body parts that are often sweaty, such as the groin and feet. One home remedy that has been found helpful in treating ringworm infections is the topical application of apple cider vinegar. Apple cider vinegar is used in many applications as a home remedy due to its natural anti-fungal properties. 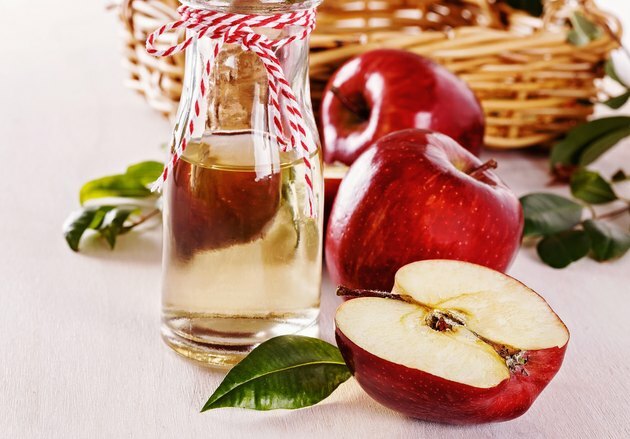 Many people suffering from ringworm infections apply apple cider vinegar topically to the affected area, using a cotton ball, several times a day. According to the Grupocompostela Health University website, treating ringworm with apple cider vinegar can eliminate the fungal infection. Applying apple cider vinegar to a ringworm infection may cause a slight stinging sensation at first. After repeated applications, topically applied apple cider vinegar will relieve any itching associated with a fungal infection. As the apple cider vinegar kills off skin fungus, the peeling and flaking skin caused by the infection will lessen and eventually disappear. Apple cider vinegar is an all-natural ringworm treatment. Many people use apple cider vinegar to treat fungal infections on children and pets because it is a safe, non-toxic alternative to prescription medications. While some severe cases of ringworm may require a doctor's attention and prescription-strength drugs, many mild ringworm infections are quickly and effectively treated at home thanks to the natural anti-fungal properties of apple cider vinegar. Apple cider vinegar is highly acidic and could cause skin burns in some individuals. It's best to first apply a small amount of apple cider vinegar to an uninfected area of the skin before using larger amounts to treat ringworm infections. By testing a small area of the skin first, you can determine if you are sensitive to apple cider vinegar. Dr. Christina Starkman, an medical doctor and homeopath, offers tips for anyone looking to treat a ringworm infection at home using apple cider vinegar. Starkman says that external treatment for ringworm will only be successful for infections that comprise just one or two patches of ringworm. More serious infections require a doctor's visit. For minor infections, Starkman suggests applying a towel soaked with apple cider vinegar to ringworm-infected skin for two 30-minute periods every day. This treatment can take three or four weeks to completely eliminate a ringworm infection. Can You Do Light Exercises After an IPL?